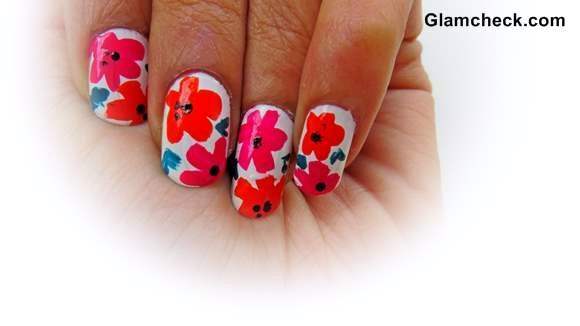 Flower Nails are not just a Spring trend anymore, but a great way to brighten you dull winters as well. 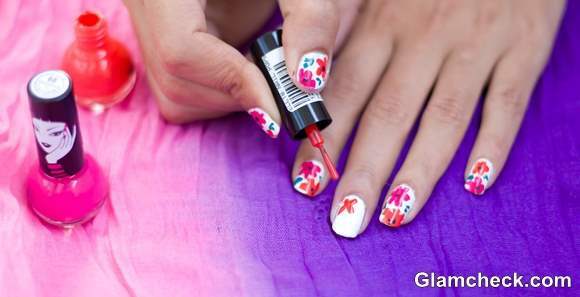 It is a year-round joyful nail art that many women find hard to do. But with this simple yet beautiful version, we are sure you would be willing to try it out ASAP. The skills required are nothing more than a steady hand and a little patience. 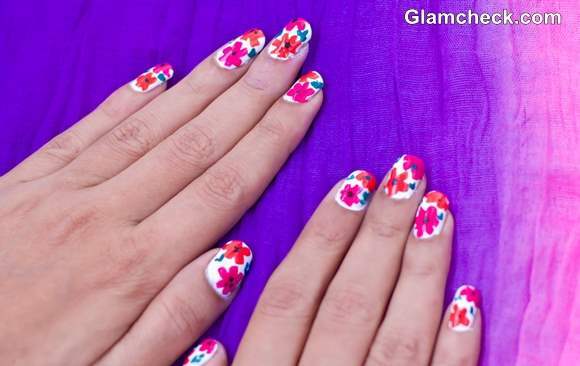 If you have these two, you too can have this awesome flower nail art on your tips. The first and foremost important thing in a manicure is to get the base right. Cut your nails, buff them and file them if you need before putting the first coat. Make sure your nail paints have a fluid consistency. If they have become, add a few drops of nail paint remover to dilute them. Apply the first coat of white on your nails. This color usually does not give full opacity in one coat and hence let it dry before you apply the next one. Once the base is fully dried, you can begin painting the flowers. Also note that the drying time varies from brand to brand. Draw a small cross from one of the brighter colors like orange. Make another cross, in the spaces left between the earlier one. Your shape will somewhat resemble an asterisk now. Only remember that these are petals and hence perfect geometrical looking shape is not required for it. Repeat the process with the other bright color – pink. On your nail, two flowers won’t fit completely hence, for the second flower draw only part of it using the same steps as above. Now place some teal nail paint on the waste card. Wipe the brush on the sides of the nail paint bottle so that no extra nail paint remains in the brush. Now dip the brush’s tip in the nail paint on the card, draw tiny random leave-like shapes around your flowers. Using a dotting tool paint tiny but visible black dots in the center of your flower. Dip your cotton swab in a nail paint remover and clean the cuticles and sides of your nails. Applying a glossy top coat is optional for this manicure. Repeat the procedure for all nails and both hands. 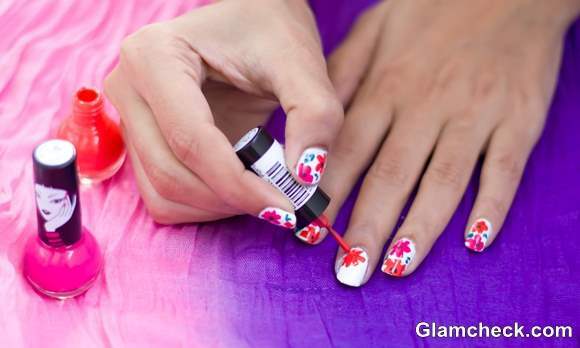 Try this nail art over the weekend and see the amount of compliments that pour in for all the effort you put in. Good luck!